Planning a college career fair requires a combination of attention to detail and creative problem-solving. How do you put on a successful career fair with a limited budget, overextended staff, and high expectations? Learning from the mistakes of others is always a worthwhile endeavor. Let’s look at three common mistakes and how to avoid them. This is an easy mistake to make, especially if you are new in your position. You don’t need to micromanage your fair planning team, but you do need to assign responsibility for everything that needs to be completed. When you assign a person to each task, that person can still ask for help or even trade tasks with a colleague. The point isn’t to dominate your team but to let everyone play a role. Plus, when you assign responsibilities, it is less likely a job will slip away from consciousness and be left undone. Instead, someone will raise the alarm, then your career services pros will act like any good team and jump in to help where it is needed. Moreover, don’t forget to recognize your team for their hard work. You continuously remind your students about the power of thank you notes – thanking your team, recruiters, and volunteers is a great example. When it comes to assigning tasks we recommend utilizing a task management application. Good ones will go a long way in helping add another layer of organization to the process. Post early. Post often. That’s the secret behind a successful social media marketing campaign. As soon as you set the date and secure your venue, start your publicity campaign. It’s okay if you don’t know all the details yet, post what you know. Starting early gives you plenty of time to find the perfect hashtag and perfect your landing page. There are many ways the Career Fair Plus app makes promotion easier and more effective. Read Can a Mobile App Help With Career Fair Promotion? for ideas on how to use these best practices for your fair. We’ve compiled the data collected from 1500 successful career fairs to determine the optimal days and months to hold a college career fair. The most popular day for career fairs is Wednesday. It’s in the middle of the week, so recruiters have more flexibility when they make travel arrangements. Students are less likely to have exams on Wednesdays, so they will be free to attend the event. Your students are more ambitious and focused (and less weighed down by school work) at the beginning of the semester. Consequently, September, October, February, and March are excellent choices for holding your fair. For more details, see our blog article: What is the Best Day of the Week to Host a Job Fair? Planning a college career fair is not easy, but the benefits to your students make your work worthwhile. 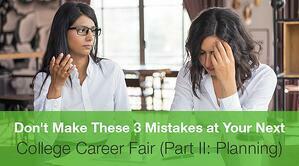 If this is your first career fair, learn everything you can from the successes and failures of others. Even if you are an old pro at the planning game, you can still learn from the mistakes of others. One excellent, but often overlooked, source of advice is the event planning world. For example, this article from the International Institute of Event Management: The 5 Most Common Mistakes in Event Planning (and how to avoid them!) shares information that any career services team can put to use.